Last month, I had the great experience of helping my 11-year-old nephew clean his room. Maybe you think that it would have been more fun to take my nephew to the fair, but I was much happier helping him clean his room. 1. It was less expensive (by far). 2. I got to focus on nothing but him and his life for two hours. 3. None of his siblings were “jealous” of our alone time. 4. We accomplished something important to him. If you were to look at the “before” and “after” (no photos, to protect his privacy), you might suspect that I actually cleaned his room for him. Not true. For most of two hours, I sat in a chair with a garbage bag and bossed him around. Here’s the progression of what we did: The Lecture. I sat with Sam on his bed and told him what I’m sure his mother (my sister) has told him hundreds of times, “This is your private space; you should be proud of it. Every time you come in this room, you should be happy to do so and you should easily find anything in this room. Your younger siblings look up to you; if you set an example of keeping your room neat, they will keep their rooms neat, too.” Etc., etc. You get the picture. I followed up the lecture by laughing with him about the sign he could put on his door (he has his own room) to keep the space private (“Keep Out!” with a drawing of a skull and crossbones, for example—well, that’s not the way I would put it, but he is an 11-year-old boy). Preparation. Before we started, we got set up for some serious room cleaning. First we found a blank sheet of paper and a pen and cleared a place for them on his desk. We would use this paper to write a list that he could share with his mother of the things he needed to keep his room clean. The first item on the list was a “Keep Out” sign for his door. Next we looked around the room and identified what big containers we would need. This is a variation on the “three container” advice I gave you in one of my first columns, “Order = Calm, Part 3, Down To Business!” We needed much bigger containers though: 1) for garbage 2) for dirty clothes and 3) for things that belong to his brother. We made an exception for clothes that needed to be hung up, but, for the most part, when Sam was working on one part of his room (like the top of his desk), I didn’t let him move from that area. For example, if he encountered something on his desk that belonged in his closet, I had him put it on the floor somewhere in the direction of his closet and stay put at his desk, rather than walking over to his closet. Of course we eventually needed far more than three containers. 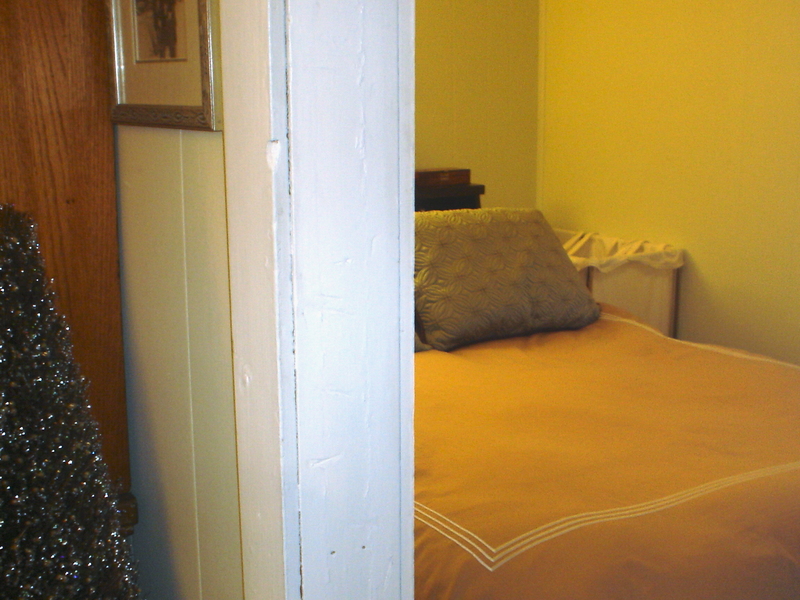 But we kept at it for almost two hours and, by the end, (if you closed the closet door), the room was clean indeed. 1. A repeat of the lecture (This is your private space; treat it with pride). 2. Reminders of the tasks he had left to do (show his mom the list we made, clean his closet, go through his desk drawers). 3. Tips for keeping his room clean (clothes never go on the floor—they are either clean and get put away or they are dirty and go in the laundry, make your bed EVERY DAY, nothing goes under your bed unless you are storing it there). I loved that I had the opportunity to be so helpful—certainly for a week or two for Sam and his mom, but maybe, just maybe, for the long term too. I guess what I’m trying to remind you is that it isn’t housekeeping skills that make you a domestic goddess; it’s using the skills that you do have to be truly helpful. That’s why I’m certain that we all have the capability to be domestic goddesses. List of tasks to complete in hand, with time carved out to get the first few done, where do you begin? I’ll address that at the end of this essay, but first I want to share some principles that apply to most any housework project you would undertake. 1. Room to put things away. If your drawers are so packed that it’s hard to shut them when half of your clothes are in the laundry, you aren’t going to put your clothes away automatically. Take clothes that you don’t wear out of your drawers and your closet now, and make going through them and deciding their permanent fate another project on your list. 2. Containers that work and that you like to put things away in. It’s enjoyable to put clothes away in a dresser that you love where the drawers are all the right size and slide out easily. 3. Location of storage near where things are used. If you put your pajamas away in a drawer that is right where you change in the morning, putting them away is just as easy as throwing them on the floor. The best example I have of put-away-ability involves my shoes. I like the way my shoe display looks and it is located right next to the spot where I usually change my shoes. 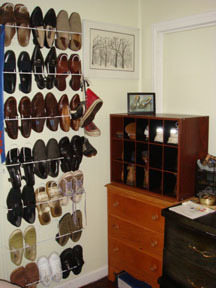 You will notice from the picture that my shoe storage is full at this point, which means that when I acquire more shoes, I will have to either get rid of some, put some in storage, or move somewhere where I can install another shoe rack. 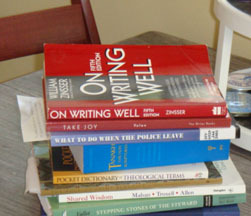 My nemesis in keeping the house picked up is BOOKS. There are books in every room of my house, but the only large bookshelves are in my office. All my bookshelves are full and putting books away is a big job. But, I am always bringing more books into the house! Putting books away on my bookshelves is not an everyday task; moving books from various places around the house into my office is. I learned this method from a social worker. Every time you start a sorting/putting-things-away job, take three containers with you: one for items to take to another room, one for items to throw away and one for items to give away. The containers don’t have to be attractive and match, but wouldn’t it be more fun, and don’t you – you who are doing all of this hard work of putting your house in order – deserve some fun? The real beauty of this system is that you can stop at almost any point in your work and a) not have a mess and b) be able to start work again at any time without retracing steps. Know when you can stop working on a project and not leave yourself a mess or put things back into disorder again. For example, when you have just dumped a drawer out on the kitchen table, you are not at a stopping point. When you have gone through the contents of that drawer and done your three container sort on them, you are at a stopping point. You can quickly wipe out the drawer and return the items that belong in the drawer, even if you don’t have time to order that drawer in the adorable drawer dividers you bought for that purpose. One of your goals is to never leave a mess for yourself. 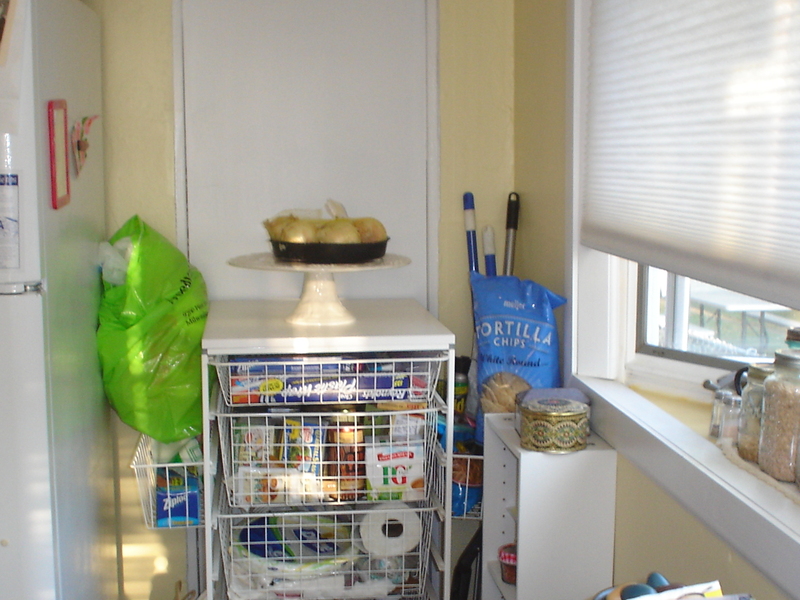 I keep: a trash basket, scissors, tape, pens and paper in every room of my house. 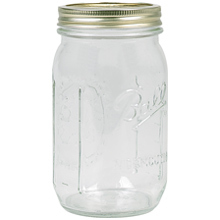 These items never need to be put away in other rooms because they belong in the room that they are in. Next, I’d work on the kitchen, because that’s where you spend a lot of time and, if you’re anything like me, that’s the place you are most likely to have other people visit. After that, it depends on what’s coming up. If I have an overnight guest coming soon, I might want to work on my three-season porch, because that’s where I have guests stay. If the school year is about to start, and I know I’m going to need my books, I might work on the bookshelves in my office. You are doing this for yourself, so you really need to prioritize based on what will make the most difference to you. For example, I’m easily embarrassed, and it would be quite embarrassing to me if someone showed up to spend the night at my house, and the room where I was going to have her sleep was a mess. I would make it a priority to put that room in order—to prevent an anxiety-producing scenario for me, rather than to impress her. I was telling a friend of mine about this column and I said, “I didn’t expect to spend three weeks in a row on housework” and she said, “We never do, Julia, we never do.” Well, housework never ends, but things get a lot better as you put your home in order—as long as you keep doing your basic tasks every day. And, mark my words, if you decide that it’s important to you to put your house in order, you’ll do it. But it takes time, and I implore you to be patient with yourself while you’re working on it. Now we’re going to take a break from housework (not doing it, just talking about it) for a few, maybe even, several weeks. When we come back to it, I’d like to address a really interesting question that a reader asked me that I didn’t have an answer for, “How do you keep your house neat if you’re an artist living in a small space, and you need to keep your supplies and projects out to work as you are inspired?” She added, “My ‘projects’ are spread out in my living room, which is the first thing that you see when you walk in the house. I don’t have any extra space or rooms to keep things out and out of sight of visitors.” Good question. Any thoughts? Last week I wrote about daily housework; this week I want to address the question of how to even begin when you’ve let your house get so out of order that you figure that it’d be easier to move than pick up your house. As with any major change in your life, such as exercising regularly or eating healthily, the first step to a neat house is psychological. As I said last week, it’s going to take time to keep your house neat, which means that you are going to have to carve out time for housework – which is no small matter. If you are anything like me, your days are not filled with fluff; to make time for housework, you are probably going to have to make difficult choices such as cutting back on hours at work, volunteering, relaxing with your spouse and children, or exercising. The price for a perpetually neat and orderly house can be quite high; deciding how you will pay for it is the first step. The next step is psychological too. You have to convince yourself that you deserve to have an orderly and (visually) calm house. When I came to the realization that having a tidy house would be good for my soul, I began repeating the following affirmation to myself several times a day: My home is neat and orderly because I need a calm house and I always take care of myself. If regular housework is going to be a new habit for you, these preliminary steps are essential. The habit of picking up your house won’t “stick” unless you have deliberately made time for it and you believe deep down in your soul that it is important to you. Let me be clear that when I talk about how much time it takes to keep your house neat, I mean to be encouraging, not discouraging. That is, places that we live don’t just stay neat without work. Mine doesn’t; my mother’s doesn’t; none of your friend’s homes do; none of your mom’s friend’s homes do. If your house is not neat, it does not mean that you are necessarily doing anything wrong. You just have not carved out the time on a regular basis for picking up. Only you are qualified to make a judgment of whether that is right or wrong. At least my bed is made! You need to make your own list; write each task down individually, then cross things off as you do them. It really makes you feel confident and efficient to cross things off your list everyday. In the beginning, you might even want to save all of your crossed-off lists in a place where you can look at them easily to remind yourself of how much you are accomplishing! The next chunk of time you need to carve out is the time you are going to spend getting your house in order. Some people take three days off work for this, some people give themselves two hours every Saturday morning, some make time daily. Whichever time you choose, schedule it and protect it—and (of course) write a list of specific things you want to get done and cross them off as you accomplish them. As you are planning your tasks, start to think about things that can do double duty time-wise. 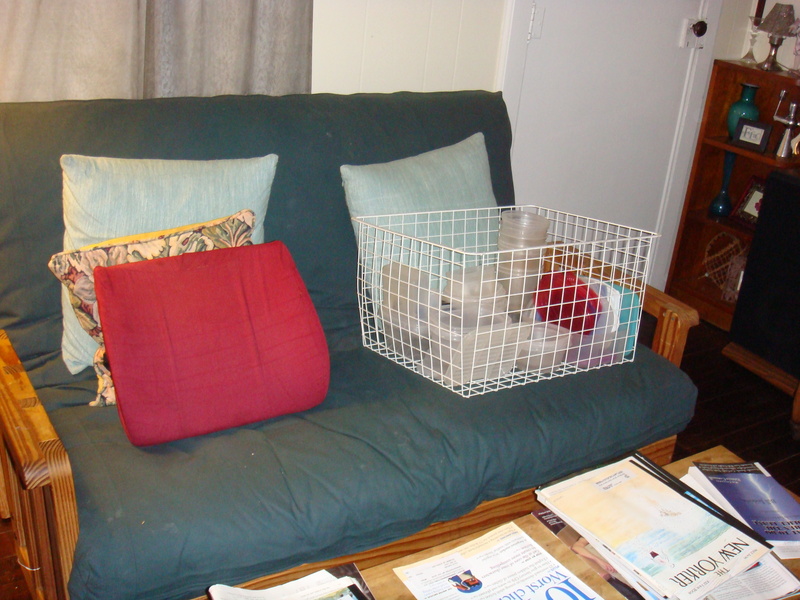 For example, when I had to put my drawer of plastic containers in order, I took the entire drawer out of the storage unit and put it on my sofa, next to where I watch TV, so I could get that done while I watched a movie. A friend told me the other day that she had her young son take a basket all around the house to pick up everything that was his; then she met him in his bedroom and helped him put everything in the basket away. She was getting some significant picking up done and spending one-on-one time with her son. (This friend also told me that she cleaned her refrigerator while she was making dinner the other evening, which I can’t even imagine, unless her family was having one of my favorite dinners: potato chips, ice cream and beer). One thing that really helps me to get things done is to give myself deadlines that involve other people. I make plans for a friend to come over to help me carry some boxes of archived files into storage, then I know that I need to go through my filing cabinet before next Saturday morning so that I am ready when she arrives. 1. Look at your schedule and plan time for housework. 2. Write and begin saying affirmations that will help you convince yourself that housework is important for you to spend time doing. 3. 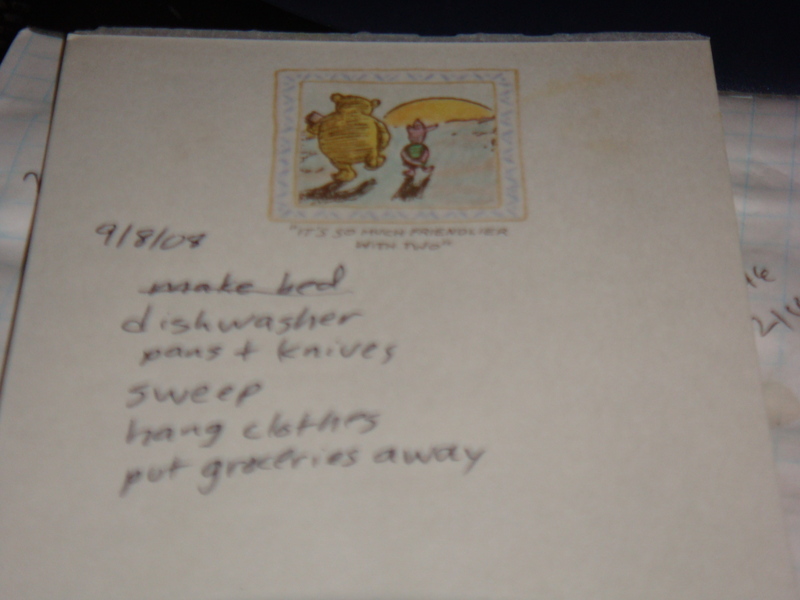 Write a list of housework tasks that you can get done every day and begin doing them. 4. 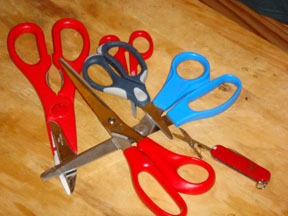 Begin a list of larger housework/putting things in order projects that you are going to work on. 5. Schedule help from other people that requires some preparation on your part. If you must start Housework (with a capital “H”) before next week, please, please don’t start any project that you can’t finish. You don’t need to do anything to discourage yourself so early in the process—like make a mess. Most importantly, this week, I want you to remember: The goal of putting your house in order is not a clean house that impresses other people; it’s creating a space that you thrive in. The first point I’ll make about housework is that it TAKES TIME. Even I, a person who keeps a far-from-immaculate house, lives alone and hires a cleaning service to take care of my floors and bathroom, plan for at least ¾ hour of housework a day. That’s how long it takes me to make my bed, load and unload the dishwasher, wash my knives and pans, wipe the kitchen counters, sweep my floors and pick up the clutter that has accumulated from the previous day. I used imagine that people with clean houses kept them that way effortlessly. Now I know that is pure fantasy. My mother’s house is very, very neat and clean; which I always envied. Then I broke my ankle last spring and spent six weeks sitting in her living room watching how she and her husband really live. I was shocked to realize that they spend about the same amount of time each week that I do on housework. They clean up promptly and completely after each meal; they pick up the house everyday after work; and every Saturday morning they sort the accumulated mail and magazines of the week. I thought that neat houses happened magically for people who were organized and always put things away; I was wrong. 1. Don’t live in your house. Eat all your meals out. Always shower and dress at the gym. Never have people over; entertain only in public places that other people keep clean. Have your mail delivered to a post office box and never, ever bring it into your house. 2. Clean-as-you-go. Always, always, always, pick up and put away everything you use. As soon as you finish eating, thoroughly clean the kitchen. Open all of your mail everyday over a waste basket. 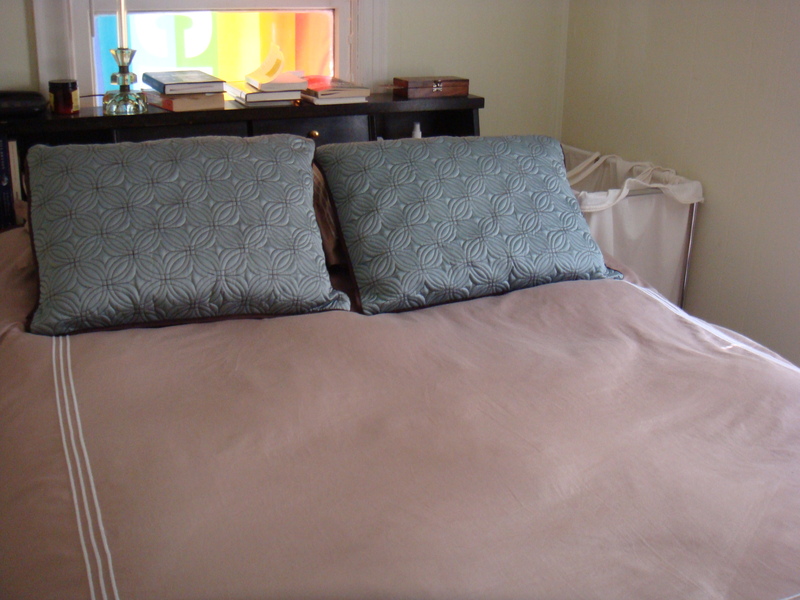 Make your bed as soon as you wake up. Unpack as soon as you get home. 3. Schedule time for housework everyday. This is what I do and the time that I’ve scheduled is in the morning. I try not to leave the house for the day unless it is reasonably neat. This list assumes that you schedule separate time for cleaning the house. I hire that out, and I know that seems terribly indulgent of me to some, but I don’t care and I highly recommend it. For one thing, it forces me to do a thorough job of picking up every two weeks. It also means that every two weeks, my whole house is tidy and clean. When I’ve done my cleaning myself, the whole house was never clean. One week, the bathroom was clean. The next week, the bookshelves were dusted, but the bathroom was starting to get dirty. The next week the kitchen floor was clean, but the bathroom floor wasn’t. Well, anyhow, if you clean your house yourself (which I think is kind of crazy), you need to schedule separate time to do that, apart from daily housework. Between cleanings, there are tricks to making your home look tidier than it is. Along with my tips, I’ve included some actual photos from my house, which is actually quite small and filled with “stuff.” That way, you’ll know that I’m talking about a real house, with real storage and cleaning issues. 1. Make sure that the first area people see when they walk in your house is neat. 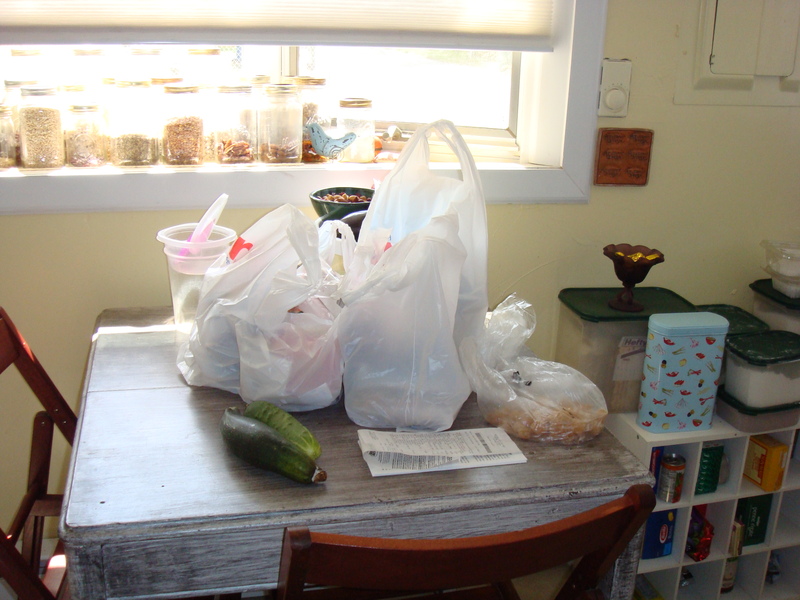 In my house, the first thing you see is a corner of my kitchen where I keep my plastic bags and onions. As you can see from the photo, this is not the loveliest corner of my house, but it is organized, and I do my best to keep it tidy. 2. 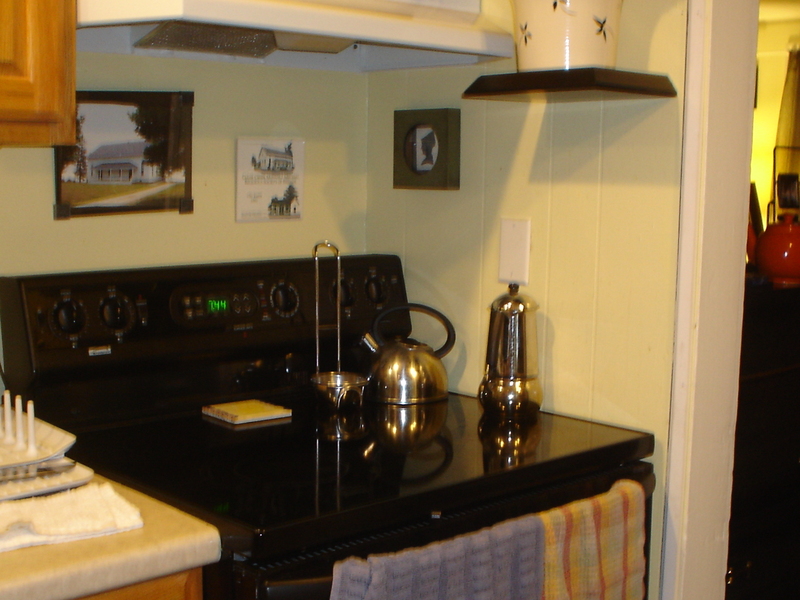 Keep counters and your stovetop clean. You’d be surprised at how people assume you are tidier than you are if you always keep your stovetop clean. 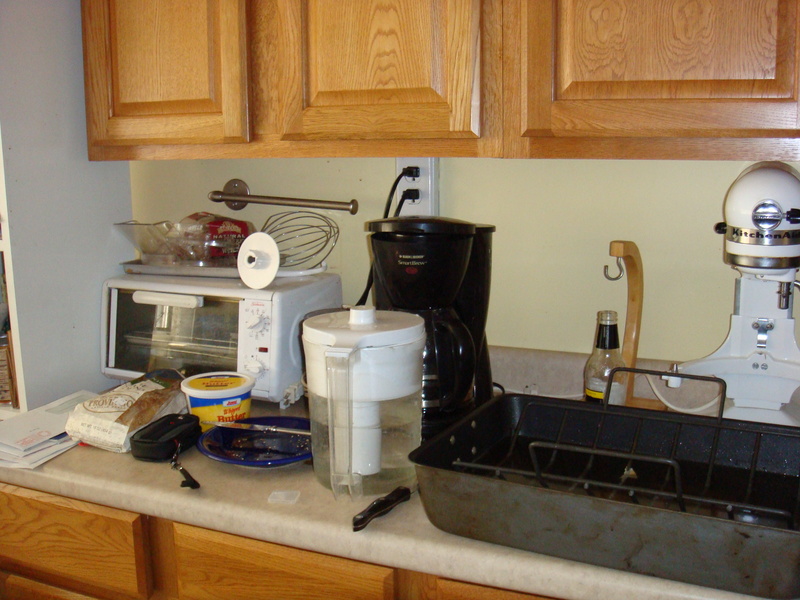 And, even just coffee grounds or crumbs from your breakfast toast on your counter will make your kitchen look unkempt. Remember, if it’s at eye level it’s going to be seen and registered, even if only subconsciously. 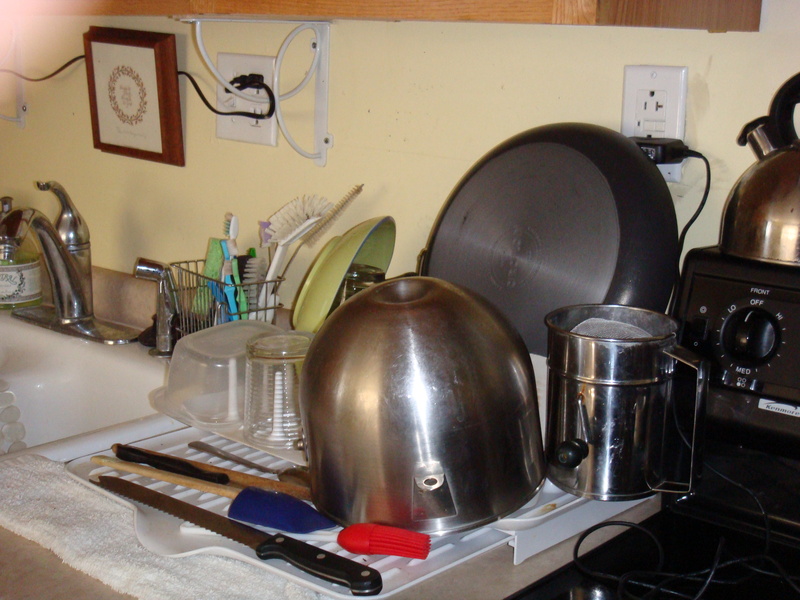 Likewise, you can get away with a sink full of dirty dishes if your stovetop and counters are clean.